Allied begins as Wing Commander Max Vatan (Brad Pitt), an intelligence officer with the Royal Canadian Air Force, parachutes into Morocco. The first step in his mission to assassinate a German ambassador is to make contact with a French Resistance agent, Marianne Beauséjour (Marion Cotillard), who will be posing as his wife. After changing out of his khaki field jacket and into a snazzy suit befitting his cover and his warm surroundings, Max strolls into a nightclub to the tune of a boozy, contemporary take on “The Sheik of Araby” and meets his pseudo-wife. Max: Heard a lot about you, saying you were beautiful… and good. Marianne: Being good at this kind of work is not very beautiful. Following some champagne with friends, Marianne escorts Max back to their home, where they are to live as Maurice Berne, a phosphate miner from Paris, and his wife Christine. Although the two “spouses” were strangers before that night, they quickly succumb to their mutual attraction on the rooftop of their apartment building. English costume designer Joanna Johnston deservedly received much praise for her work on Allied, including nominations from the Academy Awards, the British Academy Film Awards, and the Critics’ Choice Movie Awards. After changing out of the military-inspired safari jacket and desert gear from his parachute entrance to Morocco, Max changes into a snappy beige Irish linen suit that would be just the thing a successful businessman would wear for a hot desert holiday. 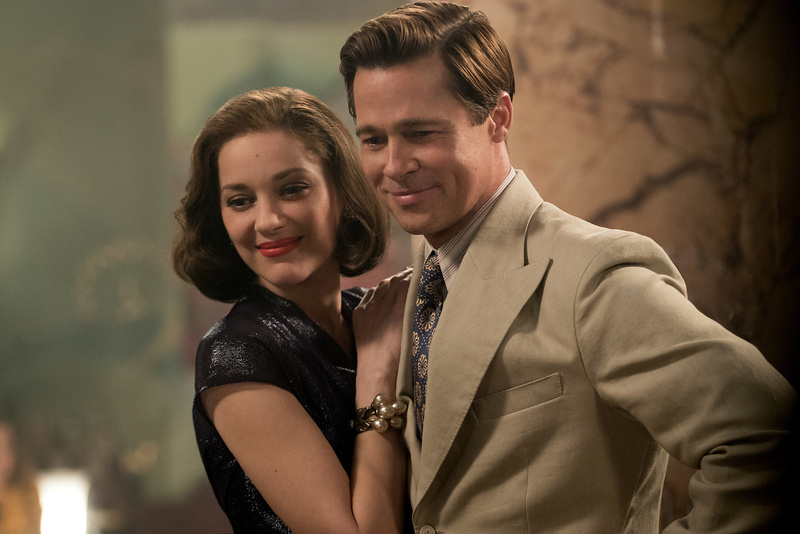 Production photo by Daniel Smith of Marion Cotillard and Brad Pitt in Allied (2016). Note the edge stitching on Max’s wide suit jacket lapels. According to The Hollywood Reporter, Johnston hired tailor Michael Sloan to craft Max Vatan’s sharp suits. 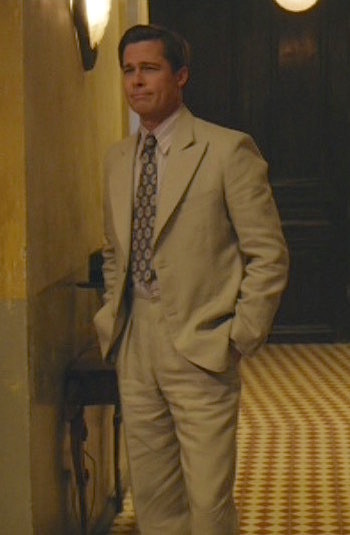 While in Casablanca, Max exclusively wears suits with peak-lapel jackets, even for single-breasted suits like this one. The wide peak lapels roll to the top of a two-button front with three matching buttons on the cuffs. The ventless suit jacket is suppressed at the waist with padded shoulders, emphasized by the width of the lapels, that creates a strong, athletic silhouette. The jacket has a welted breast pocket and large, sporty patch pockets on the hips. Max gets acquainted with his “wife” over a drink. The trousers of Max’s suit have an appropriately long rise consistent with the era’s trends, with short double forward pleats on each side that rise only as high as the natural waist. A single button fastens above the straight fly with no extended tabs or belt loops on the waistband. Max wears a set of black-and-beige striped cloth suspenders with silver adjusters and hardware that connect to buttons on the inside of the trouser waistband with light brown leather hooks. His trousers have side pockets, jetted back pockets (at least on the left side), and turn-ups (cuffs) on the bottoms. With the family Citroën safely parked in the garage, Max and Marianne can commence to getting further acquainted. After some careful shoe making, Crockett & Jones have produced a selection of styles for Allied, featuring Brad Pitt and Marion Cotillard. We note ‘careful’ as 1940s styling ushered the use of Ivory Calf, Beige Burnished Calf and White Nubuck, not the easiest of materials to keep clean in a 19th century shoe factory. With ivory being a recognised colour-way of the time, we held our nerve and the shoes looked great! Max wears the latter footwear in this scene, a pair of ivory calf leather oxford brogues with a medallion-perforated wingtip and five lace eyelets for the shoes’ ivory laces. His dark charcoal gray herringbone socks may be woven from a luxurious fabric like cashmere. 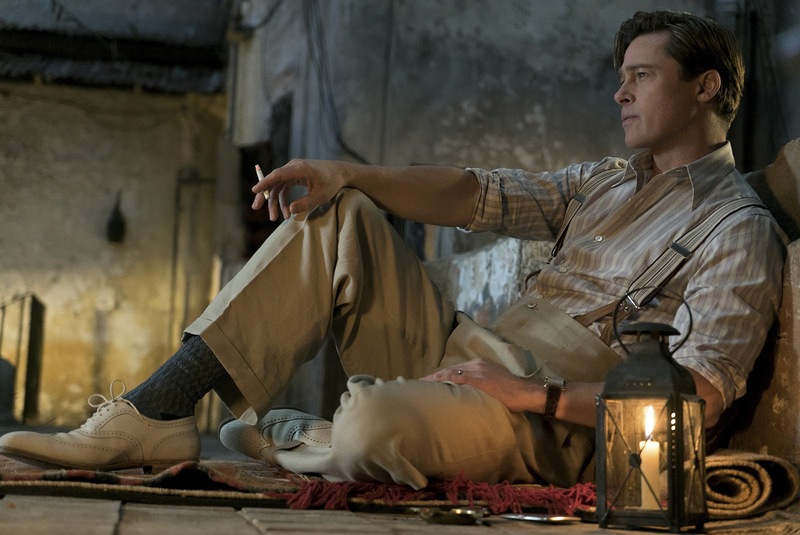 Production photo by Daniel Smith of Brad Pitt in Allied (2016), reclining on the roof of his character’s apartment building in Casablanca. Max wears a complex striped shirt styled in the 1940s tradition with a long point collar, front placket, and double (French) cuffs that he wears with gold cuff links until he takes out the links and rolls up the sleeves to his elbows. The cotton shirt pattern consists of a wide lilac stripe, shadowed with gray faded gradient on each side, on a white ground. The lilac stripes are split into three stripes by four thin purple lines. Max’s silk tie injects some additional color into his outfit. The tie consists of a navy ground with a beige dotted grid that separates the tie into diamond-shaped sections, each of which containing a beige floral “burst” pattern. As one would expect of a gentleman in the 1940s, Max rarely ventures outside in the city without his hat, a gray felt fedora with a black grosgrain band and gray grosgrain edges. 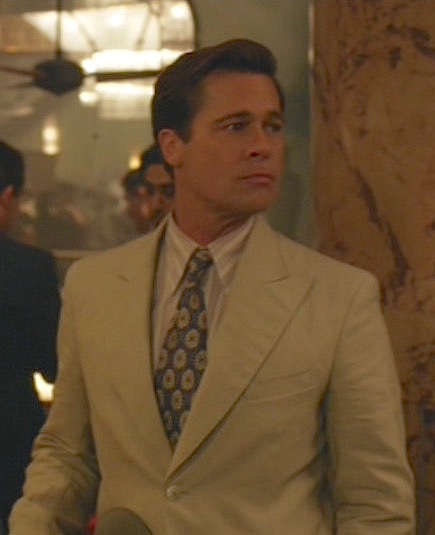 This is his primary hat in Casablanca, and he also wears it with his pale blue pinhead three-piece suit and his light gray double-breasted suit. The happy couple approaches their marital abode. Max’s bund-strapped military watch would never suit his cover as a fashionable Parisian businessman, so he wears a dressy tank watch with a large square yellow gold case on a dark brown leather strap. A friendly kiss… before things get a little more than friendly. Max also adopts other jewelry as part of his cover as a happily married Catholic: a white gold wedding band and a large silver crucifix custom-made by London jewelry designer Stephen Einhorn. “I told everyone you’re quite a serious Catholic,” is Marianne’s explanation for the large silver crucifix she gives Max to wear as part of his cover. Marianne gives Max the cross to wear the next morning, when he strolls around their apartment in a gold striped silk robe and his white “waffle-weave” sleeveless undershirt. A beige linen suit is a must-have for warm weather, but the elegant, era-specific details and accompanying shirt, tie, and shoes set Max Vatan’s summer suit apart as he establishes his cover in Allied‘s wartime Casablanca.